Terms & Conditions1. I.D. REQUIRRED TO BID: All purchasers must present a valid government issued photo I.D. to receive a bidder number to participate in the auction.2.FULL PAYPMENT: All purchases must be PAID FOR IN FULL on auction day prior to removal. Payment may be made in the form of CASH, Cashier's check, Personal or Company check with a Bank Letter of Guarantee only, Visa, Mastercard or Discover. Buyer shall pay any and all applicable taxes unless exempted by law. Proof of tax exemption must be provided at the time of purchase. Buyer acknowledges that Seller has provided him with the opportunity to inspect the item(s) before purchasing them and the buyer is responsible for full payment whether he has or has not inspected the items.3.BUYER'S PREMIUM: A 10% Buyer's Premium will be added to the high bid on all items. Once totaled, this will establish the final sale price plus any applicable taxes.4.ACCEPTANCE OF TERMS: A bid by any person shall be conclusive proof that the person has made himself acquainted with these conditions of sale and has agreed to be bound by them.5.DESCRIPTIONS: Though all descriptions and commentary are believed to be correct neither Auctioneer nor Seller makes any warranties or representations of any kind with respect to the property and in no event shall be held responsible for having made or implied any warranty of description, genuineness , authorship, attribution, providence period, culture, source, origin, condition etc.6.ALL SALES FINAL: All Sales are final and all property is sold as is where is. It is the bidder's responsibility to determine condition and usefulness of the items purchased and no refunds will be made.7.DISPUTES: The buyer shall be the highest bidder. In case of a dispute between the 2 highest bidders the auctioneer at his sole discretion may reopen the bidding between the 2 highest bidders until property is sold.8.TRANSFER OF OWNERSHIP REMOVAL AND THEFT: When the auctioneer says sold the title of the property shall pass to the highest bidder who assumes full responsibility. All property shall be removed from the premises by the purchaser at his own risk and expense within the time period announced by the Auctioneer. Purchaser is responsible for their purchases from the time the Auctioneer declares them sold. The auctioneer and the auction company are not responsible for misplaced or stolen items.9.RESERVE AUCTION AND RESERVATIONS: The Auctioneer and seller reserve the right to accept or reject any and all bids. On lots upon which there is a reserve the Auctioneer shall have the right to bid on behalf of the seller. 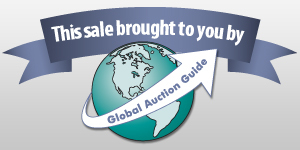 Auctioneer also reserves the right to withdraw any item before or during the sale. Auctioneer may reject a nominal bid or fractional bid advance if in his estimation it proves injurious to the sale or the seller.10. PERSONAL INJURY FIRE OR THEFT: Person attending the auction preview the Auction itself or during the removal of good assume all risk of damage of or lost to person and property and specifically release the auctioneer from liability therefore. Neither the Auctioneer nor his principal shall be liable by reason for any defect in or condition of the premises on which the sale is held including but not limited to personal injury fire or theft.11. REMEDIES: If the foregoing conditions or any other applicable conditions are not complied with in addition to other remedies available to auctioneer and seller by law including without limitation the right to hold the purchaser liable for the bid price the auctioneer at his option may 1.) Resale the property publically or privately with the purchaser being liable for the payment of any deficiency plus all cost incurred or 2.) Cancel the sale retaining all liquidated damages on all payments made by purchaser auctioneer commission and all other incidental damages will be charged.12. AGENCY: Auctioneer is acting as an agent and agent only and is not responsible for the acts of his or her principals.13. ANNOUNCEMENTS: Announcements made by the auctioneer on sale day supersede all previously written emailed fax or oral representations made by anyone. Announcement:Information contained herein is presented on behalf of the seller. Live Action Auction, agent for the seller, cannot guarantee the information to be correct or assume the liabilities for errors and omissions. All lines drawn on maps are approximate. Buyers should verify the information to their own satisfaction. Any announcements made from the auction block on day of auction will take precedence over any matter of print and will be final.